Although the U.S. population is obsessed with dieting, this obsession has not translated into positive results. Obesity continues to increase among all age groups and serial dieting is on the rise. The core of the problem is our inability to stay on a diet until we reach our target weight and then maintain it. Most weight-loss diets simply fail to provide the satisfaction that we need and expect from food. Research at leading obesity laboratories has started to focus on the disconnect between dieting and food satisfaction in the hope of finding a solution to help end diet failure. This research has identified a number of proteins that are naturally released in the GI tract when we eat and act in the appetite centers of the brain, where the feeling of satisfaction or satiety is localized. The practical implications of these exciting new findings form the basis of an exciting new concept called healthy satiety. Healthy satiety is an innovative new eating strategy uses specific nutrients to activate the body’s natural appetite control switch, thereby enabling individuals to achieve greater satisfaction from their diet at a lower calorie cost. These specific nutrients, which studies now show are powerful controllers of appetite, have also been shown to provide additional health benefits, including a reduction in cardiovascular disease. Healthy satiety can be incorporated into any diet plan to help individuals lose weight and, once they achieve their target weight, to help them maintain it. Until now, healthy satiety was the essential component missing in all diet plans. Although satiety is often confused with fullness, there are important differences between the two phenomena. Everyone is familiar with the feeling of stomach fullness that is experienced after eating a meal. Fullness is associated with a satisfied feeling in the stomach or, if you overeat, an uncomfortable feeling. The feeling of fullness stimulates a signal to the brain that tells us to stop eating. Foods that are high in fiber can produce a feeling of fullness; however, they are not effective in activating the “feel-full” proteins. Therefore, whereas fiber may make you feel full, it won’t necessarily maintain satiety for an extended period of time after you eat. Satiety is the feeling of satisfaction, or not being hungry, that lasts long after that initial feeling of fullness has subsided. Satiety is the sensation that keeps us from snacking between meals. The feeling of satiety involves a number of natural physiological actions that start in the stomach and ultimately affect the appetite center in the brain. The presence of food in the stomach stimulates the release of special proteins in the digestive tract. Scientists call them appetite regulatory peptides, but you can think of them as “feel-full proteins.” The release of these proteins initiates a number of actions. First they close the valve leading from the stomach into the intestine. This slows the digestion of food, giving us a feeling of fullness and extinguishing the drive to eat. The second action initiated by the feel-full proteins is to send a signal to the appetite center in the brain. This also tells us to stop eating, but, more importantly, it is responsible for the extended feeling of fullness that occurs between meals. Not all nutrients produce the same degree of satiety. Certain types of fat are the most effective, specific types of proteins are second, and carbohydrate has the least effect. Healthy satiety is the selective ingestion of those nutrients, either before a meal or with a meal that will maximize the overall satisfaction you get from the meal. The initial research on the biology of satiety was conducted at Columbia and Cornell Universities almost 40 years ago. Scientists showed that the body’s primary satiety peptide, cholecystokinin, or CCK, reduced food intake and extended the feeling of fullness after a meal. Additional studies have shown how CCK is released and how it works. Although many large drug companies have intense research efforts to develop drugs that stimulate the feel-full proteins, some of the latest research shows that consuming the right types of nutrients at the right time is also effective. These discoveries open up enormous possibilities in terms of helping people lose weight and maintain a healthy weight. There are two primary dietary practices that promote healthy satiety. With the increased prevalence of energy-dense processed foods, the availability of eat-and-go restaurants, and busy lifestyles, most Americans consume meals in a very short period of time. A meal at a fast food restaurant, which can be as much as 1,200 calories, can be consumed in five minutes. Even though the body has a sophisticated appetite control system, in today’s environment it kicks in too late, since the food is already in the stomach. Healthy satiety involves changing your meal pattern to turn on your appetite control mechanisms before you eat your meal. The best way to do this is to consume foods that contain those nutrients which are extremely effective in activating the feel-full proteins. The fats that are most effective are called long-chain fatty acids. These are also monounsaturated fats and are found in high concentrations in corn oil, canola oil, olive oil, safflower oil, sunflower oil, peanut oil and soybean oil. Although not as potent has the aforementioned fats, certain proteins, especially soy and whey (a dairy protein), are very effective. Consuming a small amount of foods rich in these nutrients will release the feel full proteins before you start eating. Thus, you will feel fuller even if you eat fewer calories. Here are some high satiety appetizers. Because these oils are so effective in turning off your appetite, you only need a small amount. The ideal type of meal to eat for healthy satiety provides maximum satisfaction without too many calories. The term “Satisfilling” has been used to describe this type of meal. A healthy, Satisfilling meal has three components: at least one low-density food, at least one high-satiety food, and a satiety activator. Foods are classified as “low energy density” when they contain a relatively low concentration of calories. The least energy-dense foods are those that contain a lot of fiber, which is found prevalently in fruits and vegetables. Such foods help us eat less because they fill a lot of space in the stomach with relatively few calories. If we combine these foods with those that also have high satiating value we get the best of both worlds – fullness and satiety – with fewer calories. 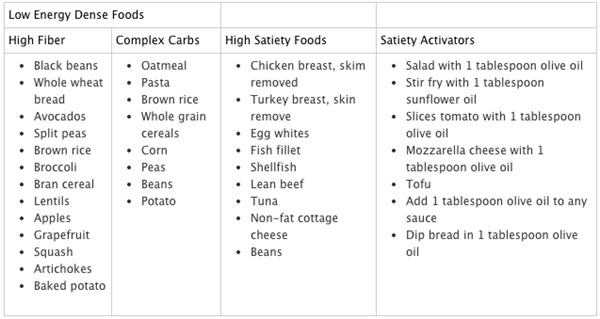 The table below lists examples of low-density foods that provide fullness and high-satiety foods that offer satiety. Adding a small amount of one or more “satiety activators” to a meal combining low-density and high-satiety foods will ensure maximum satisfaction in a calorically efficient manner. Healthy Satisfilling meals should not include processed foods that contain high amounts of saturated fats and sugars, which give you calories without providing meal satisfaction (fullness plus satiety). In addition to the two primary steps to healthy satiety, there are three secondary steps. The more frequently you eat throughout the day, the less hunger and the more satiety you will experience between meals. When you are less hungry at the start of each meal, you will tend to eat less. When you skip breakfast, you are usually extremely hungry later in the day, and consequently eat much more. Eating breakfast results in a feeling of satiety that causes you to eat less during the rest of the day. A study published in the American Journal of Clinical Nutrition found that women who ate breakfast voluntarily consumed roughly 100 fewer calories throughout the entire day than women who skipped breakfast. Another important step in practicing healthy satiety is developing a better understanding of when you’re really hungry and when you’re not, and training yourself to avoid eating when you’re not hungry. Emotional Eating: Often the factor that drives our eating is not physical hunger but emotions such as happiness, sadness, or even boredom. Learn to tell the difference between real, physical hunger and emotional food cravings. Spontaneous Eating: Often we eat food just because it’s there, even when we’re already full. This adds a lot of useless calories to one’s diet. The best way to avoid spontaneous eating is to eat on a regular schedule. Unconscious Eating: Sometimes we eat without even being fully conscious that we are doing so (often in front of the TV). Food journaling is a useful tool you can use to steer clear of unconscious eating. Habitual Eating: Eating out of habit instead of hunger is known as habitual eating. Eating on a schedule is a good thing if the schedule is sensible, but becomes a bad thing when the schedule is not sensible. Clearing Your Plate: Sometimes we start to eat when we’re hungry and don’t stop when we’re full. Instead we keep eating until we finish the food that’s in front of us or until we are uncomfortably stuffed. The best way to avoid this type of mindless eating is to serve yourself smaller portion sizes. There are three essential requirements for successful weight loss: calorie reduction, exercise, and healthy satiety. The slight reduction in daily calorie intake that is needed for weight loss can be achieved on a variety of diets: low-fat diet, low-glycemic, Mediterranean, and so forth. Exercise promotes weight loss by enhancing your daily caloric deficit, or the gap between the number of calories you consume and the number of calories your body uses each day. Healthy satiety facilitates weight loss by allowing you to maintain a daily calorie deficit and still feel satisfied. The average weight-loss diet lasts less than three weeks. One of the major causes of diet failure is the nagging hunger that comes with eating less. The healthy satiety strategy is specifically designed to allow you to eat less without hunger, so you can stay on your diet—any diet—until you reach your goal weight.